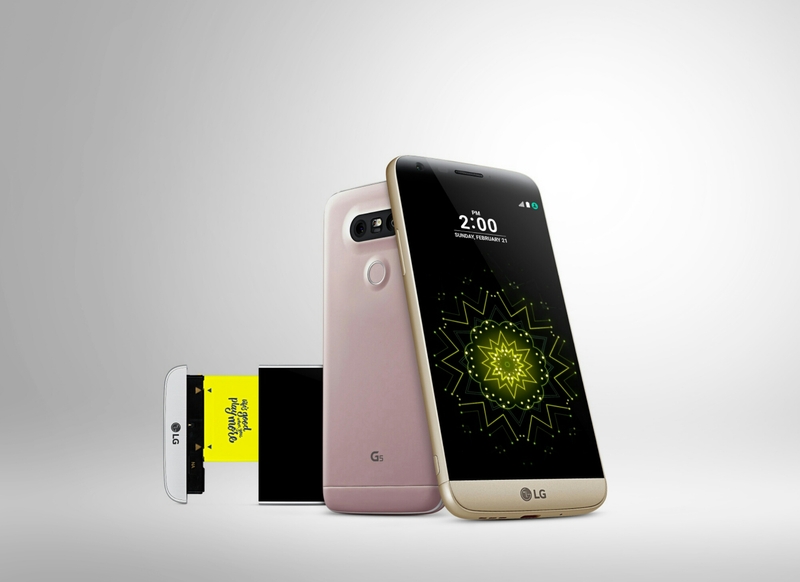 Dubai, 22nd of February, 2016 — LG Electronics (LG) unveiled its highly anticipated LG G5 smartphone, a brand new design with not only a sleek, metal uni-body featuring a Slide-out Battery and a Modular Type design that gives a greater smartphone experience. Complete with LG Friends, a collection of companion devices, the G5 can be transformed into a digital camera, Hi-fi player and more. Encased in a sleek metal aluminum body design and Slide-out Battery to easily swap out a depleted battery for a fully charged one in seconds, the LG G5 surpasses the visual experience of its predecessor, the LG G4. First, the G5’s 135-degree wide angle lens lets you choose between standard or wide angle lens to get more in the shot. Second, the Always-on Display makes notifications just a glance away with the time, date and more available anytime without waking the G5. Third, the 3D Arc Glass featured in the smartphone’s 5.3-inch displaycreates a gentle curve and a smooth metal surface using microdizing process which takes anodized aluminum to a whole new level..Furthermore, the insulative antenna is invisiblyintegrated into the body without disrupting the seamless look of the metal uni-body. LG designers took the metal body concept one step further by adding a Shiny Cut edge for added contrast and a more comfortable grip. LG’s innovative Modular Type design gives theLG G5 the ability to transform into a digital camera, hi-fi player and more all while keeping its traditional removable battery in an all metal uni-body design for the first time ever. The LG CAM Plus is a versatile camera module that can be attached through the battery slot to deliver a comfortable grip and convenient control of a DSLR. The LG CAM Plus provides physical buttons for power, shutter, record,zoom, LED display and comfortable hand grip. It also offers intuitive auto focus and exposure lock, features usually found on standalonedigital cameras. When attached to the LG G5, it provides an additional battery capacity of 1,200mAh to allow for longer shooting times for more fun and enjoyment. The 5.3-inch QHD IPS Quantum display on the LG G5 offers an Always-on feature, the first on an IPS smartphone display. First introduced in the LG V10 as the Second Screen, the Always-on feature has been enlarged for the main display to show time, date continuously, even while the screen is in sleep mode. The Always-on Displayrequires only 0.8 percent of the battery’s power every hour to operate. Reflecting LG’s longstanding reputation as a leader in smartphone cameras, the LG G5 has two cameras on the rear: one with a standard 78-degree lens and another with a 135-degreewide angle lens, the widest available in anysmartphone. The 135-degree lens on the LG G5offers a viewing angle that is approximately 1.7 times wider than those of existing smartphone cameras and 15 degrees wider than the human eye’s field of view. The wide angle lens makes it easier for users to capture more landscape,taller buildings or larger groups without having to position oneself further from the subject. As part of the G5 ecosystem, LG is introducing a wide range of companion devices, aptly calledLG Friends, to deliver fun while providing a new mobile experience far beyond traditionalsmartphone boundaries. The LG 360 CAM is a compact 360-degree angle camera equipped with two 13MP wide angle cameras, 1,200mAh battery and 4G internal memory. The LG 360 CAM can be easilyconnected to the LG G5 allowing users to easily create 360-degree content. The LG 360 CAM provides a manual mode, 2K video and 5.1 surround channel recording on threemicrophones to help users effortlessly create high-quality 360-degree contents. Thanks to the partnership with Google, images taken with the 360 CAM can be uploaded to Street View and YouTube360, adding the fun of sharing creative contents with others. The images will also be available to view on the LG 360 VR or other smartphones or devices that are capable of 360-degree content. The LG 360 VR is a VR goggle that can be connected with the G5 by a dedicated cable andworks exclusively with the G5. It has a stylish design that is foldable so that users can easily carry and watch VR content anytime, anywhere.Unlike other VR devices that require asmartphones to be inserted in the device, the LG 360 VR is about one-third as heavy as competing smartphone VR goggles. The device is compatible with 360-degree images and videos captured with LG 360 CAM as well as allGoogle Cardboard content. H3 by B&O PLAY is a set of high-end earphonesthat is compatible with the high-quality sound of the LG Hi-Fi Plus with B&O Play. Designed for audiophiles as well as anyone who considersaudio performance a top-priority in asmartphone, H3 by B&O Play is compatible with all LG smartphones. Only available in the LG G5, Friends Manager is the hub application that allows the G5 to connect with LG Friends with minimal fuss and effort. Friends Manager automatically detectsnearby Friends and connect quickly and easily inthree simple steps, eliminating much of the hassle of pairing devices. The LG G5 offers Qualcomm Quick Charge 3.0 for incredibly fast charging. By employing an intelligent algorithm, Quick Charge 3.0 is up to four times faster than standard charging and up to 45 percent more efficient than the previous generation. Next Post Kain There Ya!